103,000 jobs were added last month. Wall Street economists had expected an increase of about 185,000, according to Bloomberg. The unemployment rate was 4.1 percent for the sixth straight month. Average earnings rose by 8 cents an hour and are up 2.7 percent over the past year. The Labor Department revised its estimate of February’s job growth upward, but January’s figure was revised sharply downward. The net result was a loss of 50,000 jobs relative to prior estimates. February’s report was a barnburner: Companies added jobs at the strongest pace since 2015, and the labor force gained hundreds of thousands of workers. The report for March wasn’t as strong, but still extended a remarkable run in the job market. March was the 90th consecutive month of job growth, by far the longest streak on record. Employers have added an average of just over 200,000 jobs per month so far in 2018, a pace that has held relatively steady for the past two years. The unemployment rate hasn’t budged since October, but remains at its lowest level since 2000. “The fundamentals still remain solid,” said Dan North, chief economist for Euler Hermes North America. The slowdown in March wasn’t a surprise. February’s job growth was probably inflated by a surge in hiring in construction and the retail sector that reflected unseasonably warm weather in much of the country. Both sectors slumped in March as winter storms blew through the eastern United States. The one dull spot in February’s report was wage growth, which slowed from January. That figure was revised up slightly on Friday, and earnings rebounded further in March, rising 2.7 percent from a year earlier. Economists caution against reading too much into the month-to-month data on wages, which is volatile and prone to distortions. The bigger picture is that wage growth remains weaker than most economists would expect when unemployment is so low. Economists have proposed a long list of possible explanations, from globalization to weak productivity growth. Most still expect employers to have to raise pay eventually to attract and retain workers. But so far, employers are resisting. The manufacturing sector has posted solid job gains over the past year, and that growth continued in March, when American factories added 22,000 jobs. But mounting trade tensions with China could threaten the sector’s rebound in the months ahead. President Trump announced late Thursday that he would consider imposing tariffs on an additional $100 billion worth of Chinese products, escalating the rapid-fire exchange of trade actions by the two countries. 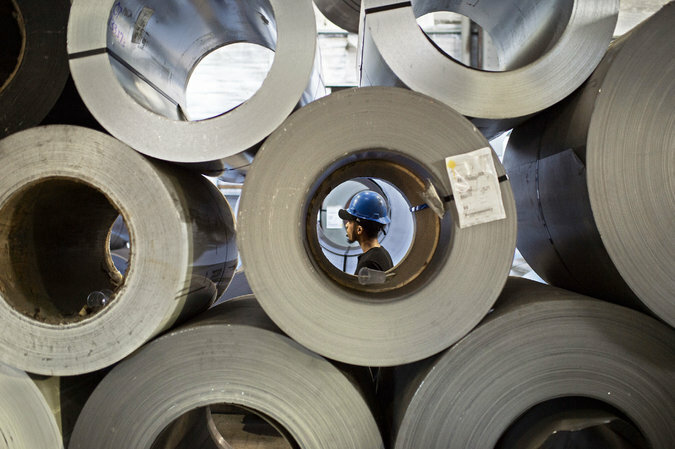 It isn’t yet clear what impact the tariffs could have on the economy. But the threat alone could disrupt some companies’ plans, economists said. “Whether trade tensions and threats come to fruition or not, even if there’s not follow-through, the lingering uncertainty and the market volatility that it creates will start to permeate business decisions and household decisions,” Ms. Zentner said. Already, she said, there are signs that upper-income households are becoming less confident, a sentiment that could affect consumer spending. Investors and policymakers alike are watching the job market closely for signs that the economy could be starting to overheat. Markets tumbled after a report of unexpectedly strong wage growth in January led to fears of inflation, and the interest-rate hikes it could bring. The market reaction to Friday’s report was more muted. The uptick in wages was sufficient to suggest that the job market remains healthy, but probably not big enough to force the Federal Reserve to reconsider its policy of gradual rate increases, said Michelle Meyer, head of United States economics for Bank of America. Indeed, in a speech in Chicago on Friday, the Fed chairman, Jerome H. Powell, suggested his view of the economy had changed little in recent weeks. Mr. Powell’s prepared remarks made no mention of the looming threat of a trade war with China. But Ms. Meyer said the added uncertainty surrounding trade could tend to make policymakers more cautious. “The risks have increased given some of the headlines around trade,” Ms. Meyer said. Perhaps the biggest surprise in the blockbuster report for February was the surge of workers into the labor force. That flood of new workers partly reversed in March, when the labor force shrank by 158,000 people. Beyond such monthly gyrations, however, the labor force has been growing gradually, an impressive feat given the ongoing retirement of the baby-boom generation. With available workers increasingly scarce, companies are going to greater lengths to find potential employees. Some are hiring people with criminal records or loosening hiring requirements. Others are trying to entice people previously on the economy’s sidelines, like at-home parents and recent retirees.